Thirsty Thursdays: Getting a beer at a beer festival in Ramallah, Palestine. 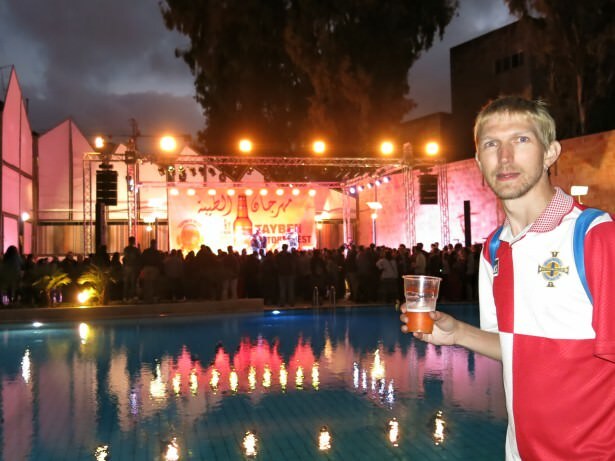 While a recent Thirsty Thursdays was about the first time I ever tried Palestinian beer (in Bethlehem), this week it’s all about the Taybeh Oktoberfest in Ramallah in Palestine. That’s right I ended up going to a beer festival in Palestine! One of my recent travel highlights for sure! Having a beer with Andy who was also working at the Abraham Hostel in Jerusalem. 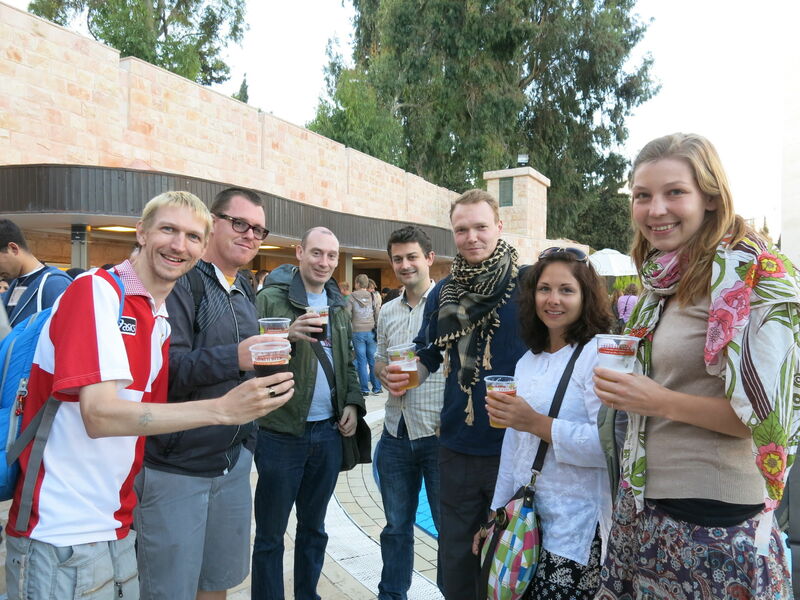 It’s a beer festival held by the Taybeh brewery (based in Palestine) every year. Basically the only Brewery in Palestine hosts an awesome beer festival for locals and foreigners alike. Of course the inspiration comes from the famous German Oktoberfests (or you might remember last year I went to the German Beer Festival in Hong Kong). Main stage at the Taybeh Beer Festival. 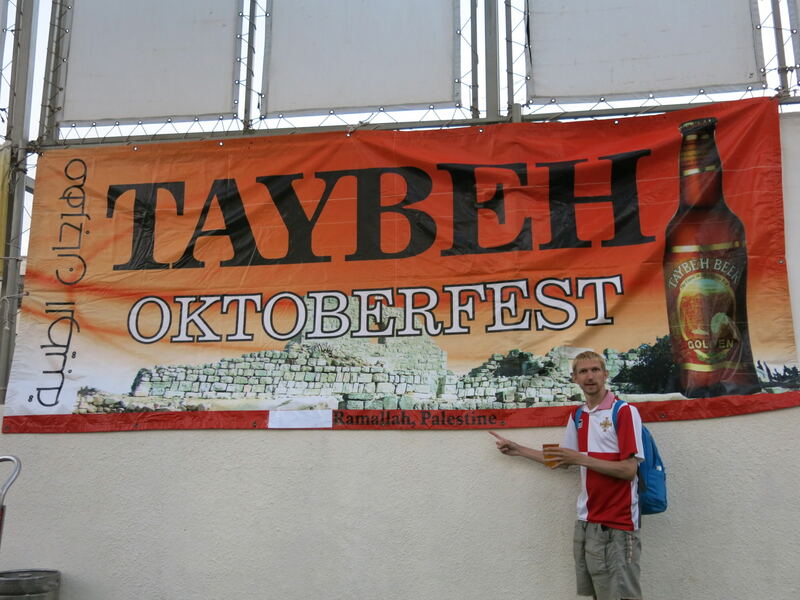 Where is the Taybeh Oktoberfest? It can change every year so keep your eye out for where it’s held. This year (2013) it was held in the outdoor swimming pool of the Movenpick Hotel in Ramallah, the capital city of Palestine (as I see it). Night falls on the pool at the Taybeh Beer Festival in Ramallah, Palestine. When is the Taybeh Oktoberfest? Obviously it’s in October, and usually held over a weekend. I went on Saturday October 5th, it was also on during Sunday October 6th. Both days the festival started at 1pm and finished at 10pm. The choices of beer – Dark and Golden. Obviously I tried them both! It costs 20 Israeli Shekels to enter the Oktoberfest. If you go as part of a tour, often the tour will include the entry fee in the price, as ours did. 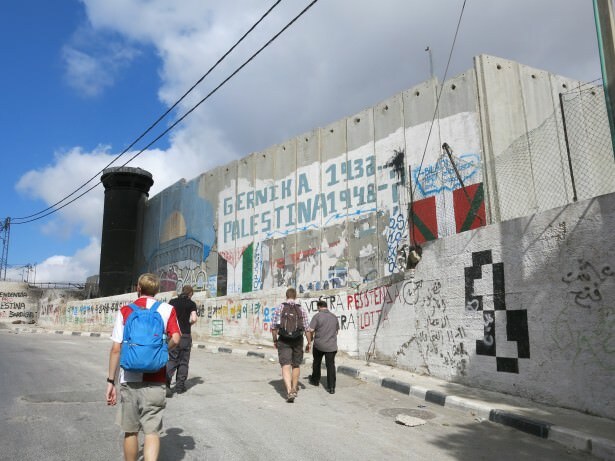 I was on an excellent “Best of West Bank Tour” with Abraham Hostels, organised in conjunction with Tourist Israel. 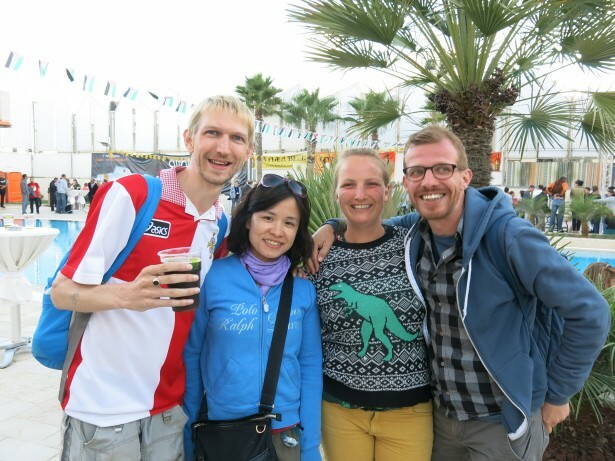 With our Belgian friends Ellen and Brenn at the Taybeh Oktoberfest in Palestine. How do you get to the Taybeh Oktoberfest? It’s held at the Movenpick Hotel in Ramallah, so just head to Ramallah on a bus, from Jerusalem. 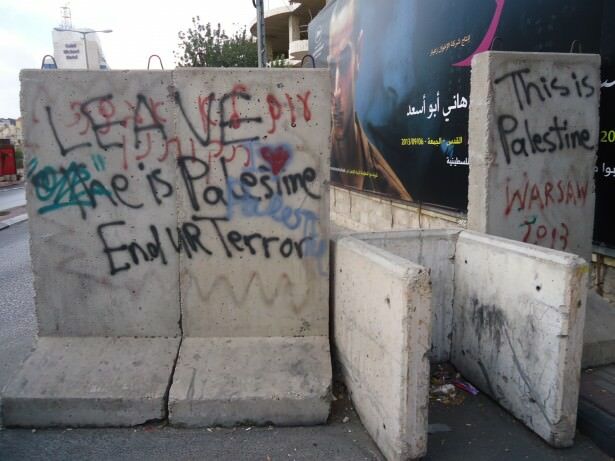 You can also stay overnight in Ramallah if you want. We went on our bus tour with Abraham Tours of course but the most common way for travellers to get from Jerusalem to Ramallah is on the Number 18 Bus service. It departs near Damascus Gate in Jerusalem on Nablus Road. The price is 7.3 Shekels and it will drop you off at Ramallah’s central square, Al Manara. From there it’s around 3 kilometres walk to the hotel – ask around and locals will definitely show you the way if you get lost. 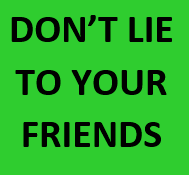 You can also taxi a local taxi, but try and share with others and bargain the price down. Bring your passport as checks are often made crossing the border. 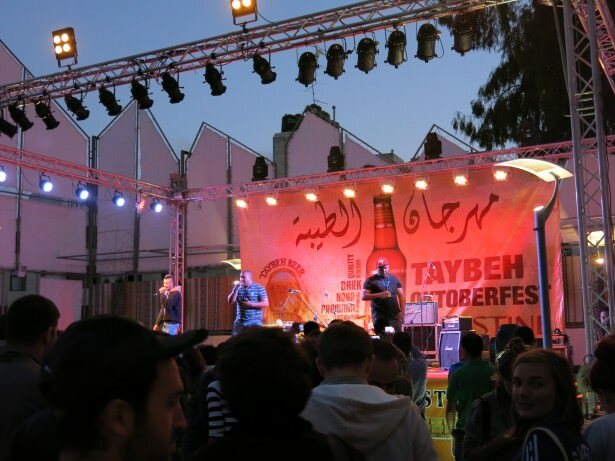 What happens at the Taybeh Oktoberfest? 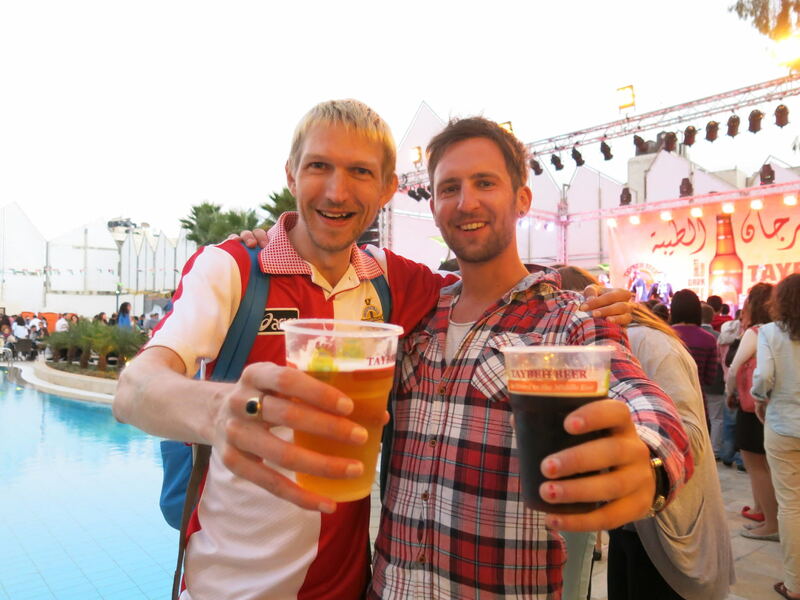 Locals and foreigners mingle to drink, chat, eat, dance and party just like any other beer festival! It’s basically a big outdoor party held in an elaborate garden complex and swimming pool in the Movenpick Hotel. 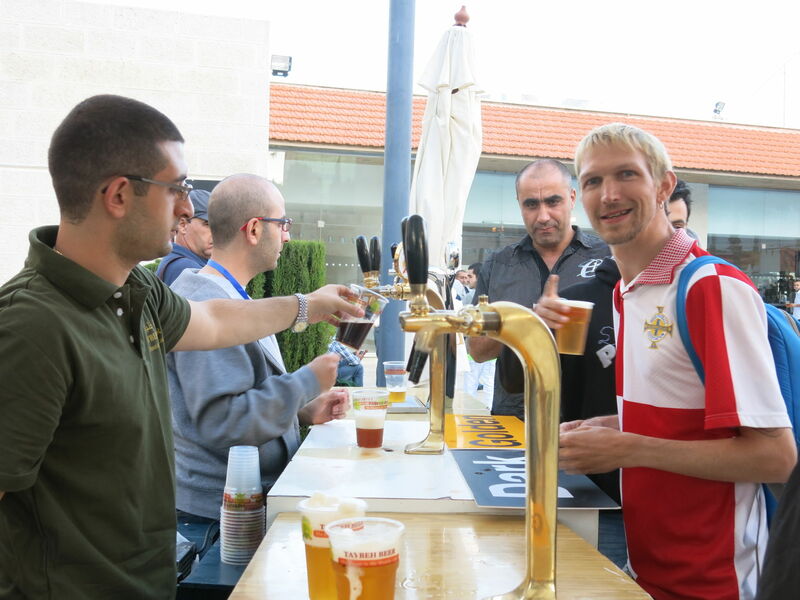 Getting my stamp on arrival at the Taybeh Oktoberfest in Ramallah. So we headed along, our bus of fellow travellers and with Tamer our cool Palestinian guide for the day! We had done a load of sightseeing in the daytime, including visiting the Shepherd’s Fields at Bethlehem, the Separation Wall and the low lying city of Jericho. After a huge day of traveling in Palestine, a beer and a festival was what we needed. Our crazy gang loving the beer and randomness of a Beer Festival in Palestine! 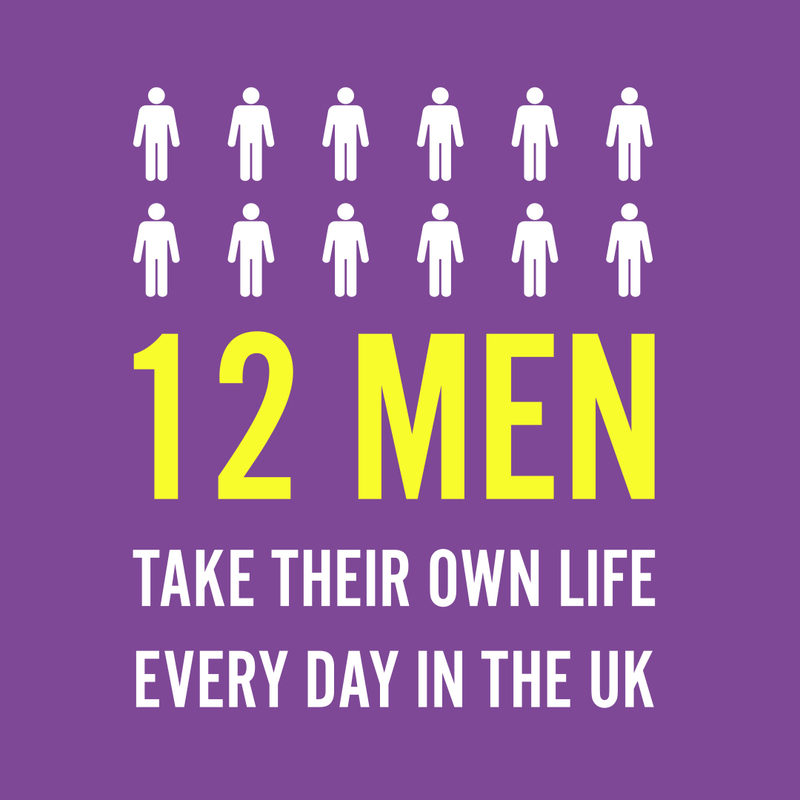 The sheer madness of it all. Everybody was vibrant in our group, which included a family of Lithuanian-Germans, Luke from the US, Steve from Scotland and a load of others on our day tour. Once we got inside, we had our arm stamped (for re-entry). 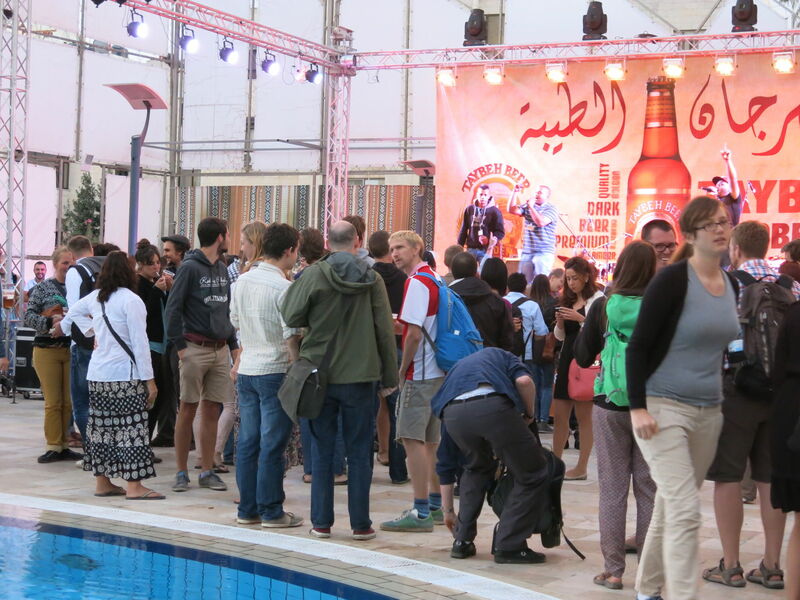 A lively crowd at the Taybeh Beer Festival in Ramallah, Palestine. Like a lot of festivals, it works with tokens – you buy beer tokens then exchange them for the drinks and food. Each token costs 20 Shekels and is good for one beer. Wine, soft drinks and food is also available. 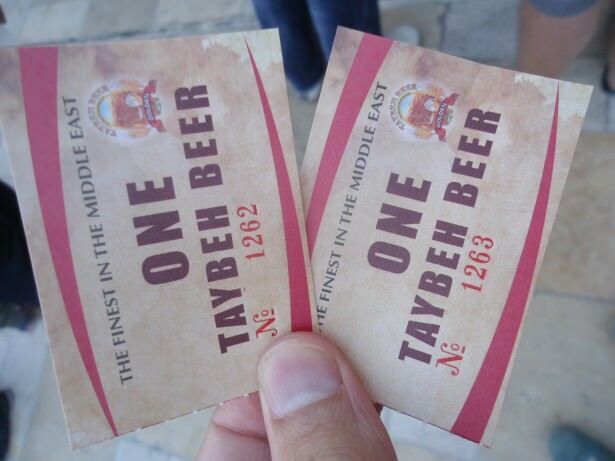 Tokens for a beer at the Taybeh Beer Festival in Ramallah, Palestine. 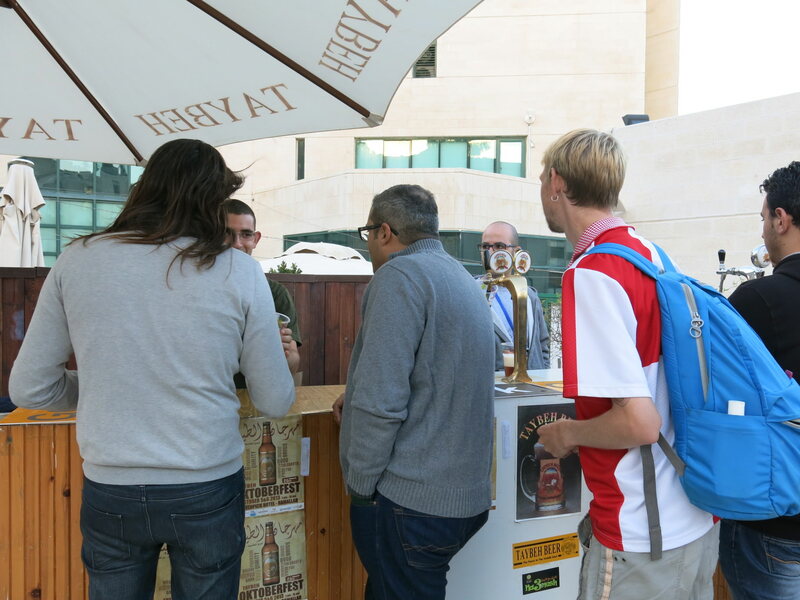 Since the beer festival is organised by Taybeh Beer, then the only beers available are of course Taybeh! 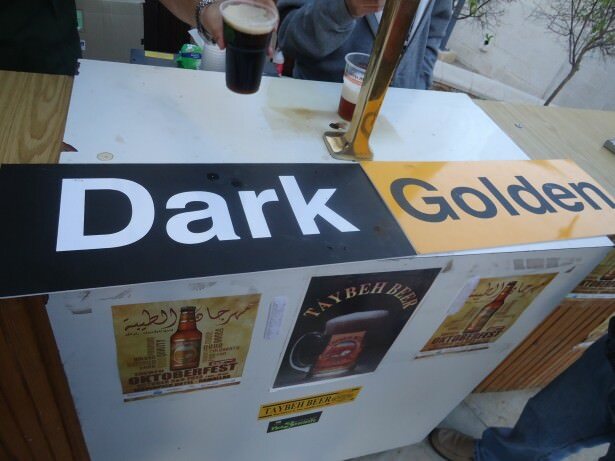 Taybeh is a great beer and they had two types at the Festival – Golden and Dark. Obviously I tried both, and favoured the dark beer. Main stage at Taybeh Oktoberfest in Ramallah, Palestine. Then a few coincidences happened! We bumped into Ellen and Brenn, a Belgian couple we had lunch with earlier in the same week in Hebron, and had also met over dinner in Jerusalem. So it was cool to see them at the festival too. Then in the queue for the toilet I met Leo, from Germany who I shared a dorm with in Tel Aviv. Panny and I headed to the front to watch live music and enjoy the festival atmosphere with the group from our bus. Then we met Andy from England who had also toured Hebron with us and was working in the Abraham Hostel! Spot the backpacker at the Taybeh Beer Festival! The music was a mix of German style, a bit of rock and even rap! 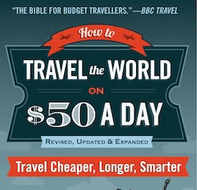 Thirsty Thursdays for Don’t Stop Living: Taybeh, Oktoberfest, Ramallah, Palestine. There was then yet another crazy travel moment as my girlfriend spotted the opportunity to be interviewed, so I was straight up to the camera and interviewed in Palestine. 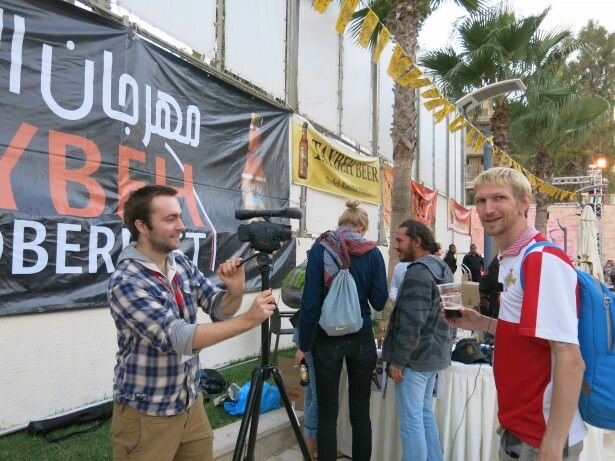 Another random travel moment – being interviewed for the camera again at the Taybeh Oktoberfest in Ramallah, Palestine. Loved the beer festival after a day or backpacking in politically charged Palestine. This entry was posted in Beer, Central Asia/Middle East, Daily Features, Destinations, Palestine, Ramallah, Thirsty Thursdays. Bookmark the permalink.